Oppo Find X tackles the notch issue with a unique innovation, but will it work? Oppo made the Find X official and it seems the phone is a direct response to the Vivo X21 that was unveiled just a few weeks back. The Find X, however, has taken Vivo's USP to another level. Oppo made the Find X official and it seems the phone is a direct response to the Vivo X21 that was unveiled just a few weeks back. The Find X, however, has taken Vivo's USP to another level. The Oppo phone comes with a slider that carries three camera modules. To top it all, the phone also hides a facial recognition scanner in the pop up. Pop-up cameras are in existence to solve the nudging problem of the notch. The Oppo Find X manages to outclass most flagships in this department. The phone comes with a screen to body ratio of 93.8 per cent which Oppo is aptly calling panoramic arc screen. This screen is an AMOLED display panel which has curved sides as well. The display looks similar to Galaxy flagships, but slightly better due to the lack of bezels. The back and front panel are both built with glass but there's no wireless charging on the phone. All this fancy technology, sandwiched between two glass panels, comes with a few concerns as well. The most prominent of these will be durability. Since the pop up camera has several motorised moving parts, the practicality of such a mechanism is questionable. However, Oppo claims that they have tested the slider for 3,00,000 uses, which they claim will last for five years. The real world reliability, on the other hand, can only be tested in the real world. The second concern is the lack of a fingerprint sensor. Oppo has dared to take the Apple iPhone X route for this feature. There is no fingerprint sensor on the device. 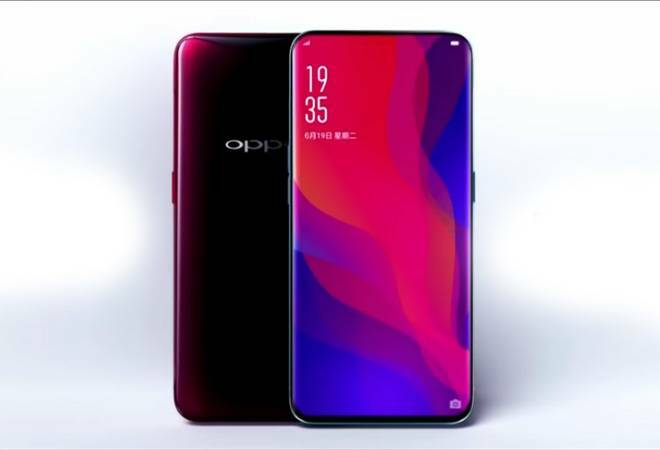 Oppo Find X just comes with a face-recognition unlock method which uses technology similar to that of the iPhone X. The phone has a dot projector, flood illuminator and infrared camera to detect facial features in dark scenes as well. The same facial mapping technology will also give us Omoji which is similar to Animojis found on Apple iPhone X. The third concern is something the company and third party smartphone accessory manufacturers will have to work on. Due to the ejecting camera module, no conventional smartphone case will work with the device. With all the glass and motorized components on the Oppo Find X, the fear of breaking the phone amplifies substantially. Oppo will be going truly global with the Find X and is expected to launch the device in India as well. During the launch event in Paris, the Chinese company revealed the European price of the device. The innovation on the device demands a premium price tag of 999 Euros which roughly translates to Rs 78,700 for the only 256GB variant. Oppo also launched a special Lamborghini edition of the device which comes with Super VOOC charging technology. According to the company, this phone can be charged from 0 to 100 per cent in just 35 minutes. The price tag on the special edition phone is even more exorbitant at 1699 Euros which roughly translates to Rs 1,34,000. Coming to the specifications of the device, the Find X has all the ingredients of a flagship. The processor is a Snapdragon 845 chip, which is currently the best there is from Qualcomm. The only variant comes with 8GB of RAM and 256GB of internal storage which can be expanded further. The screen is a 6.4-inch OLED display unit with FullHD+ resolution. In terms of optics, the phone comes with a dual lens setup on the back. The Oppo Find X has one 16megapixel unit and another 20megapixel shooter. The front panel has a 25megapixel camera. The primary camera even supports OIS for stability. The device comes with Android Oreo 8.1 out of the box and has Oppo's Colour OS 5.1 over it. The device is also eligible for Android P Beta. The battery is a modest 3,730 mAh unit but it comes with VOOC fast charging support. The Oppo Find X comes with a USB Type-C port but lacks a dedicated headphone jack.